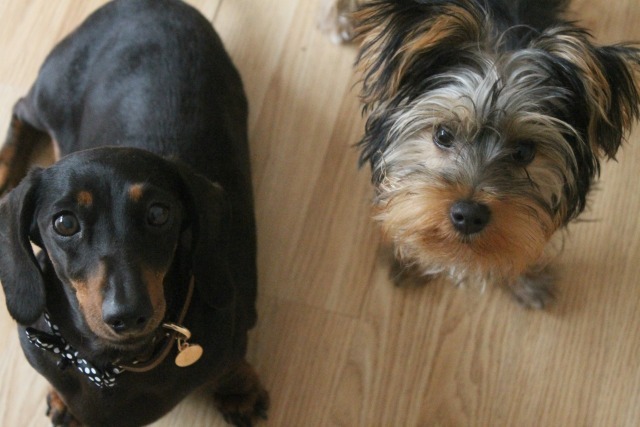 We have an exciting post today, introducing you to Archie's new big sister: Winnie! 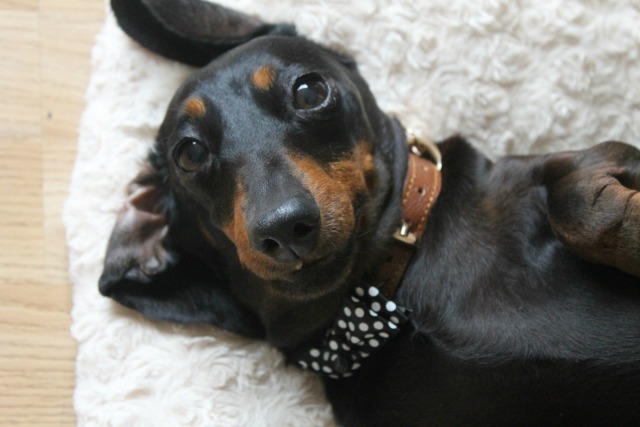 If you follow us on Twitter, you may have seen that even before we got Archie, I was a little obsessed with dachshunds. I had always wanted one, but sadly I just couldn't afford a little daxie puppy of my own, especially after quitting my full-time job in April. 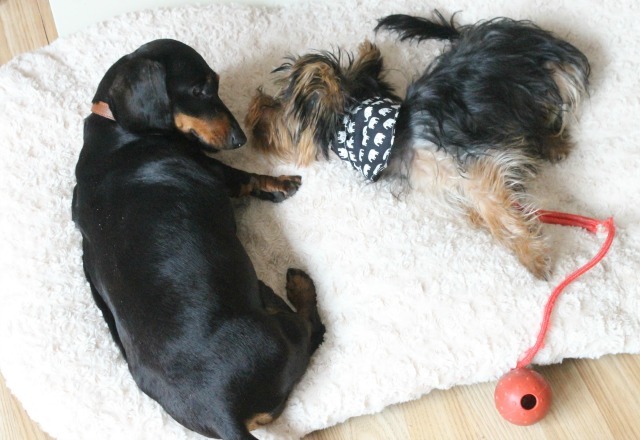 Additionally, my boyfriend was wary of potential back problems that dachshunds (and other breeds!) are prone to. He also really, really wanted a non-moulting dog. 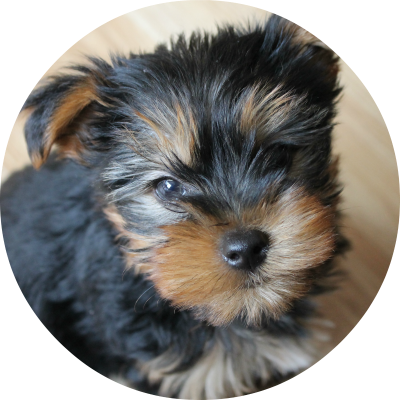 Respecting his wishes, and accepting that I couldn't afford a dachshund puppy anyway, we researched other breeds and fell in love with yorkshire terriers. We brought Archie home, and the rest is history. Now, I've known about this new position for a little while, and I was worried about Archie. He's really very chilled when left alone now, however I felt extremely guilty that he'd be alone for four hours every morning. Around July time, I decided to start looking for a second dog to keep him company, and I managed to convince my boyfriend that an adult dachshund would be perfect for us. 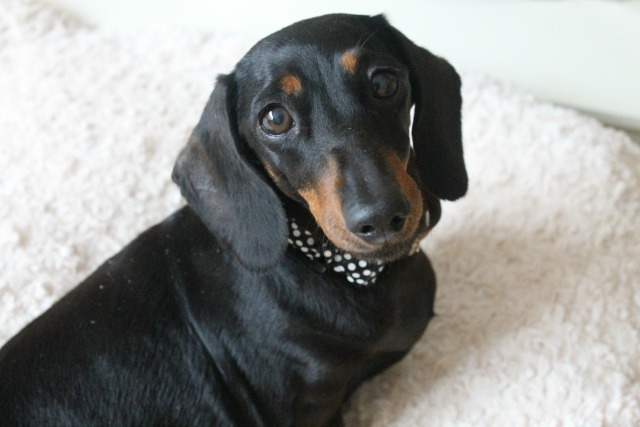 Preferably, we wanted to rescue, so we put ourselves on the waiting list for the local branch of Dachshund Rescue UK. We were told that the waiting list was over a year long, so we kept an eye out for private rehomes and even had some friends (thank you Jaime of Fachshund, you're the best) asking around for us! We came across a miniature long-haired girl, five years old, who seemed perfect. We arranged to visit (and most likely collect her) a few days later. I do like a good whinge but generally I'm quite positive, and I'd stupidly started imagining our life with her in it. I'd even renamed her in my head: Winnie. Sadly, when I texted her owner the day before to confirm times, she informed me that she'd sold the dog to another family without making me aware. I was heartbroken, and the search for the perfect dog was back on. 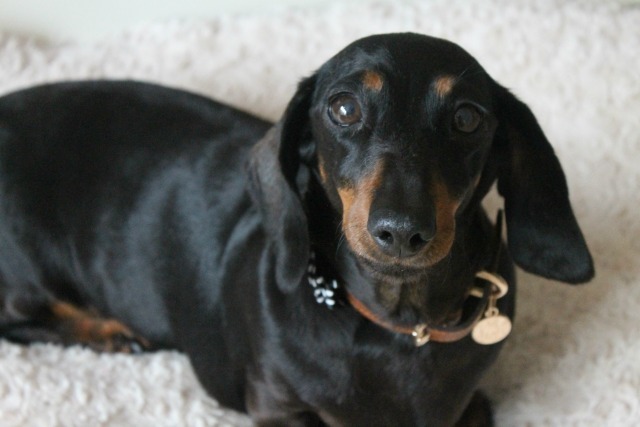 I posted in a facebook group called Dachshunds Needing Homes UK, explaining our situation and that we were looking for an older, female, miniature dachshund. I received lots of support and advice, which I'm truly grateful for, but I also received a private message. A breeder contacted me, stating that she had a three-year old female with a mild heart murmur. The lady didn't feel comfortable breeding from the dog, so wanted to move her on to a pet-only home. This can seem quite cold to some people, I know I was surprised when I first heard about breeders moving their dogs on, but it's actually quite common amongst breeders and for the most part, it is done with the dog's best interests at heart. The lady told me that the little dog was a black and tan smooth-haired mini, and she sent me a few grainy pictures. I asked what her name was, and she replied; "Blodwen". Winnie. Well, that was it. For me it was a done deal. The lady told me she didn't want any money for Blodwen, she just wanted her to go to a good home. We arranged to visit and collect her, and the next day we headed off on the three hour journey to Wales. When we arrived, her owner told us that she'd "noticed just that morning" that Blodwen's breath was very bad. Nothing prepared me for quite how bad it was, it almost made me gag, and my boyfriend had to stand in the doorway as it was so awful. She also informed us that Blodwen was six, not three. A big age difference. I didn't for a second believe that Blodwen's bad breath had just come on that day, and it was obvious she had serious dental issues, but she was so lovely and friendly that I just wanted to whisk her off home immediately. The lady handed over all of the paperwork, and we took our new girl out to the car. She was terrified of the car journey and I had to cuddle her all the way home, with my head practically hanging out the window to stop myself retching from the smell. As soon as she stepped out of the car and into her new home, she became Winnie. Thankfully, she picked up on her new name very quickly as she was used to being called "Win", and we haven't had too many issues with selective hearing, which is a big thing with daxies! Her first meeting with Archie, however, did not go well. She snapped, lunged and growled at him, which was really difficult to watch. Archie was totally confused as to why she was acting that way: the majority of the time, he was just pottering about and wasn't even trying to approach her. We had been told that Blodwen was excellent with other dogs, but unfortunately this isn't true at all. She is very reactive when we're out, and barks/growls at every dog we see. Sadly, Archie has now started barking as well, following the lead of his big sister. Additionally, we'd been told that she was pretty much house-trained... this was a lie too, as we soon found out. The biggest lie though, has been Winnie's dental issues. I took her straight to the vet the day after we got her, and the vet we saw was shocked. He told me she was 3kg overweight, had skin issues resulting from bad diet, was riddled with infection (and not just in her mouth, she had a mammary gland infection too) and the majority of her teeth were already dead and black. They told me she needed the teeth removing as soon as possible, and they warned me that it would cost a lot of money. I won't go into detail about the difficulties I had with the management of the vets, but I will say that they apparently pick and choose which clients are allowed to pay off their bill in installments. I was advised that I'd have to take out a credit card or loan if I couldn't afford the bill upfront (!! ), despite the fact that I'd fully explained how we came to have Winnie and the situation we were in. I was in a panic about where the money would come from, but after I sent her an extremely angry message, Win's previous owner agreed to pay half. The other half was made up of some incredibly kind donations from fellow dachshund owners who were following Winnie's story, and some money I borrowed from my parents. She had the procedure on Friday 26th August, and unfortunately, she has been left without a single tooth. The vet informed me that they were the worst teeth he'd ever seen, and he had no choice but to remove every single one. I don't know how her previous owner could have left her in that state; I just don't understand it. I brought Winnie home, and cried. 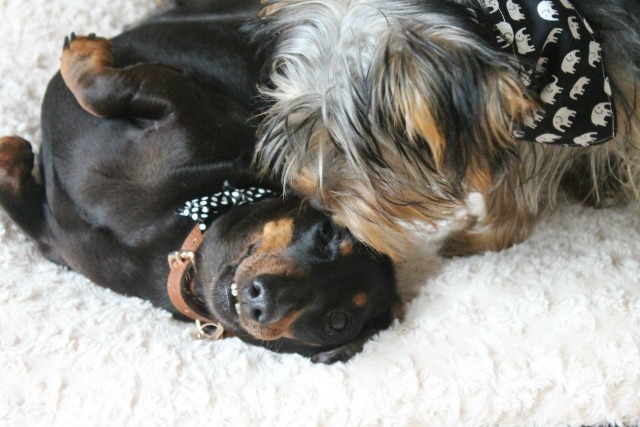 Thankfully, she has bounced back, and as you can see from the photos throughout this post (taken just before Winnie had her teeth out), she and Archie are becoming fast friends. She's getting used to my parents' dogs too, and her separation anxiety is improving every day. She sleeps soundly in a crate every night, and doesn't howl every time I go upstairs. She does still bark and howl when I leave her during the day, so I am worried about returning to work on Monday, but I know she will learn and adapt as she's improved so much already. Even her house training has come on in leaps and bounds, and she's just such a calm, affectionate little dog. Archie loves her, especially now she can't bite him (bless her) but over the last few days he's started annoying her and being a little too full on. I'm sure it'll calm down over time; they're getting to know each other, and we're still finding our stride as a family of four. The next step is to have Winnie spayed, which is booked in for the 16th September. It may not go ahead, it all depends on whether the vet is comfortable to spay her at that time. She's already lost over 1.5kg, and seems so much healthier already, so I'm hopeful she can be spayed and we can move on without any more surgery for the poor girl! The support of the dog blogging community on twitter and facebook during this time has been invaluable to me, as there were many moments during the first week that I was sure we'd made a terrible mistake. We got her on the Sunday and my boyfriend left for work in Germany at 5am on Monday, so I would have felt totally alone had it not been for my online friends. When I was crying at 2am because Winnie wouldn't stop barking, there was always someone awake to offer me a virtual shoulder. When Winnie tried to bite Archie every time he moved, there was someone to advise me on what to do. When I tried to go to the loo and Winnie howled downstairs, there was always someone to rant to. I will never forget the kindness of all these people, and I'll be forever grateful. On top of that, I will forever be indebted to anyone who ordered from my etsy shop or donated privately towards Winnie's vet bills. It took so much pressure off of me, and meant I could just focus on the dogs. People have been so incredibly generous. So there you have it, Miss Winnie's story. I know it was a long read, but I wanted to do her justice and answer any questions about her that people might have had (if you do still have questions, feel free to leave a comment or tweet me!) She is a wonderful dog, and I'm so glad we decided to take her on. She has lots of issues we need to work through, but we will get there. Thank you for taking the time to read the story of how we came to have her: here's to her future and a new life!